Now I’m sure most people have heard tales of acorns being edible but that’s as far as the myth goes. How to eat them, what to do with them, these are the questions I needed answered. John’s classes are very informal and the acorn laborers who paid for this class were a motley crew varied in age and background. And we all came together to eat acorns together; it was a beautiful thing. We took a walk around his neighborhood and we talked about identifying oak trees and types of oak trees. 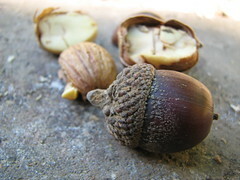 White oak acorns have less tannins than red oak acorns. 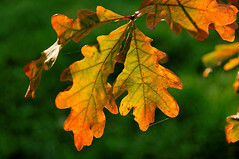 Some acorns have very little nutmeat and aren’t worth the effort. We didn’t gather acorns that day, but the walk was nice and we lucked out with the weather, even if it’s finally too cold to wear my Chacos as my main shoes. People who had access to acorns brought them and we spent a good portion of the day with hammers and rocks, peeling the nut meat away from the shell. It wasn’t too difficult but it reminded me of holiday times sitting around the bowl of nuts trying to open those Brazil nuts with all my might. Hammers do the job pretty quickly and we only had a few acorns that were infested with larvae of some creature. 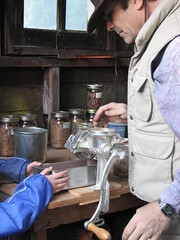 Once we exhausted ourselves separating the nut meat from the shell, we ground them in a meat grinder. The desired consistency is like grape nuts. The next step requires us to dry out the meal for a minimum of a week, but since we weren’t staying at his house for a week, we had last year’s class grind ready for us. We had to do a second grind, and it’s amazing how much kids like to work if it’s not considered “work.” Most of our grinding was child labor, but I guess it’s legal if they are not getting paid for it? The second grind was with a stone grinder (he had an attachment to the meat grinder) but somehow the stones got too hot and we started making acorn butter, which is not the desired effect. We want to make a flour and keep the fats intact. So we turned to modern machines and pulsed it up in a food processor which worked quite nicely. Then we had to soak the flour in water to leach out the tannins. We experimented with different methods but the basic goal is to keep changing the water until it runs clear. Squirrels and birds that cache acorns do the same thing with acorns, except groundwater percolates through them and by the time winter comes, their meal is ready. 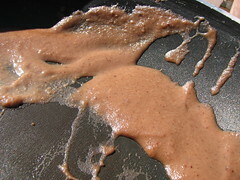 Once we had relatively tannin-free acorn mush, we made pudding! Acorn meal has a relatively high fat content and can spoil easily so we used it the same day and ate it the same day. The flour can be used in breads and puddings (I wonder how it would work for gluten free goodies?). The pudding was sweetened with lots of sugar but there is no need for a thickener because as the acorn flour cooks up it becomes deliciously thick on it’s own. The most common way of eating acorn mush is as a cooked gruel, which I think wouldn’t be bad at all with some berries mixed in. The flavor reminded me of almond meal, but not so almondy. I liked it but I think if I had to go through all this trouble to eat acorns, I might as well not have a job or house because it would take up a greater part of my time. I’m really glad I took the class and it was fun and informative but I’m happy to leave the acorns to the woodland creatures. I’ve always wondered about the less/un-popular tree nuts. It kind of sounds like you can make anything edible with enough preparation! Very interesting. I just found your blog and I’m loving reading it. I’ll be back to read more soon! So so interesting. I’d heard of Acorn flour before but never realised what a lengthy process it is! You do the most interesting things.